It's been a while since I've worked my way through one of my Project Pan products, and I'm happy to say that I'm finally done with the Maybelline SuperStay 24 Hr Concealer. Fortunately, this is one of the Project Pan products I can say grew on me (a little) as time wore on. After reading a bunch of reviews, I bought the Maybelline 24 Hr Concealer because I was looking for a creamy concealer I could use to cover up my blemishes. This is not the concealer for that, unless you have somewhat oily skin. My biggest complaint about this concealer that it seriously accentuates any dryness you may have on your skin. Seriously. About 80% of a blemish's lifespan on my face is spent being dry from all of the salicylic acid and benzoyl peroxide I've applied on it. This meant that if and when I used the Maybelline 24 Hr Concealer on those spots, an unattractive dry ring would appear around my pimple before long. So I gave up on using it to conceal blemishes and began using it as an under-eye concealer, as it was closer to my summer color. Here, it performed much better. It has decent coverage as a dark circle concealer, but you have to work rather quickly because the formula dries fast. But after using it multiple times a week under my eyes, I noticed some little bumps in my under-eye area, leading me to believe that it may not be as non-comedogenic as it claims to be. 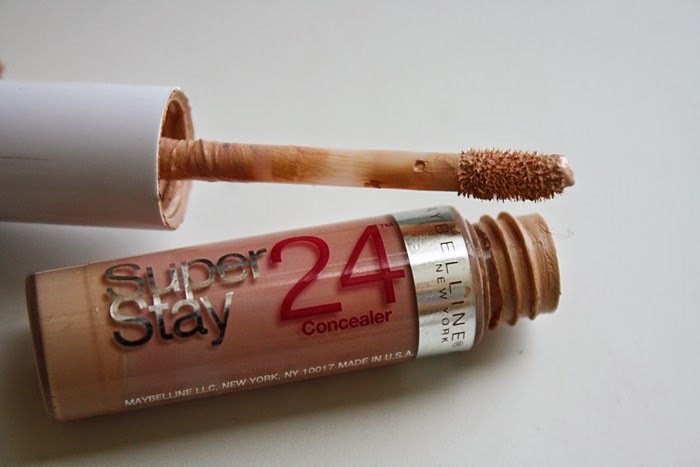 Ultimately, I would definitely not repurchase the Maybelline SuperStay 24 Hr Concealer. I don't know if it lives up to its claims of not transferring, but it definitely does not stay put ... and definitely not for 24 hours. Aside from the flaking around pimples, I noticed that it did not continue to conceal my dark circles as well throughout the day as when I had initially applied it. I think I made a misstep when purchasing this concealer and perhaps the Maybelline Fit Me concealer would have been a better choice. Have you used the Fit Me concealer before, and do you recommend it for concealing blemishes? If not, what drugstore concealers would you recommend for that purpose?